"I just adore watching Roxanne Evans Stout pick up that scrubbly old brush, and shlop on the matte medium, hap-hazard-style, and I love the scratchy sound it makes on her pages. The videos are wonderful,” says Sylvia Grantins. "Roxanne encourages her students to find their magic and make their own way, and her lessons offer endless wisdom and insight to help you with each project. She is available to help with challenges and questions as you encounter them and encourages students to post them on the class Facebook so everyone can benefit from the discussions,"
As we go, we play with new materials and techniques in many smaller, connected projects: we write, make time for inspiration in our studios, slow down and notice light and color, record special moments, and spread beauty onto our pages and into our lives. - The Winds of Change in the Autumn. There will be four components or sections to each week's theme. The main projects will be in our Book of Wanderings, but there will also be a "Pathways" component, "Letters to Myself" and "Studio Moments." Each of these will sections will have videos as I gently guide and inspire you through our projects. The videos will be yours to access forever! You will have access to the blog for at least two years... After that you can email me and I will sign you up as a reader again. Our projects will begin with constructing our books using a very easy and fun technique. Next I will share and guide you through my processes from the backgrounds, to collaging, and lastly to embellishing and adding the final details. - Working with pan pastels, inks and watercolor paints. - Collaging with texture papers and fabrics. 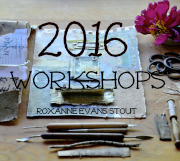 - Adding different elements to our collages including metal and wood, wire, threads and found and collected objects. - Stitching by hand, wiring, attaching, constructing and assembling, painting, collaging, designing and most of all creating. - Arranging and photographing,(any camera or your cellphone will work). As many of you know, I love arranging everyday objects into still-life's and vignettes. And to find beauty in the natural world and even the smallest details... I would like to share my processes with you during this workshop. Photographing your art space and easy and using creative art and writing prompts will also be included in this workshop. - Writing, I will share five writing exercises and videos that are easy, fun and creative! Five weeks of inspirational projects, ideas and prompts. New posts with links to the week's videos will be posted every week for five weeks. Over 25 high definition videos to inspire and guide you, filmed in River Garden Studio and my home. A private blog that will help you organize your projects from start to finish and where I will share more ideas and art that goes hand-in-hand with our themes. A private Facebook group where you can share your projects and get to know other like-minded souls. Beautiful photographs and quotes throughout the blog and videos. Inspiration that will find it's way into your life, your heart and your lifetime!! * High speed internet is recommended as well as a google account. * A list of course materials will be provided later, after you join the workshop. * You will be invited to the Private Facebook group after you register. * Sorry, no refunds after the class begins. All levels of skills are welcome! After traveling through Pathways and Wanderings with Roxanne, you will see your world and possibilities through fresh, new eyes, and you will have a beautiful book filled with your own magical pages of inspiration. 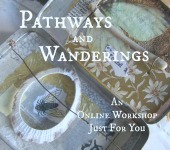 you will be automatically signed up for Pathways and Wanderings! material lists, private invitations and updates! “I think we all agree that this has been an amazing class and that [Roxanne] has been more supportive than any instructor needs to be,” writes Annette Sigler Maloney. but not in my studio. Window light is ever present, always warming, always clear. This week I have been glowing in the excitement that Storytelling with Collage, Techniques for Layering Color and Texture, the book I have been working and dreaming about for the last few years has a cover design and has it's own spot on Amazon Books!! This book has been on my mind and in my heart for so long. Now it is real, now I can visualize it and now I am even more anxious for it to come out and share it with the world! Here is a new glimpse of my studio. I have made some changes. Now my studio is just for collaging. Not to work on my computer, (I do that on the dining room table now) and I am moving my encaustic station out to the garage. Here is a close up of one of the photos that you might see in Storytelling with Collage. I am very thrilled that I got to do all the photography myself!! Dozens of new collages and never before seen photographs fill the pages. so you can create your own version of them yourself. You will see how I begin and how I get inspired. 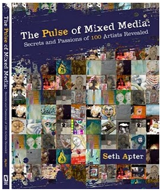 And I will put your name in a drawing for one of my new pieces of art featured in this book. It will be a surprise collage just for you!